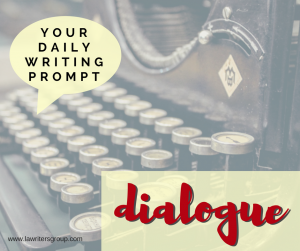 This week’s creative writing prompts focus on writing better dialogue. Every Sunday we start a new theme for the week’s writing prompts. There’s a lot of talk out there about making sure each of your characters has a unique voice, but there’s not a whole lot of talk about how to give each character their own voice. Every person has their own way of speaking and so should each character. To give your character a unique voice, you need to understand their diction (speaking style and word choice). A character’s word choice is based on their background. Someone from South Boston might choose different words than someone from Southern California. Make a list of words that each of your characters (or two invented characters) uses based on their backgrounds, then write a scene in which at least two characters are talking and practice having each character use some of those words. See if you can make each character identifiable solely based on what they are saying, not on the dialogue tags (Jack said, Sally said).